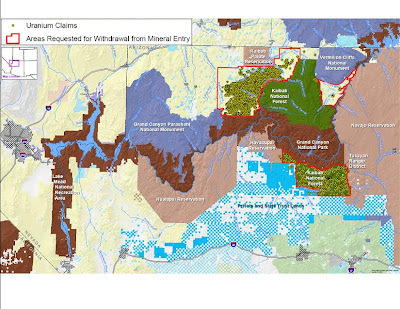 We've gathered testimony, legislation, letters, and other materials from last Friday's Congressional hearing in Flagstaff on uranium mining in northern Arizona and posted it on the Arizona Geological Society webpage. 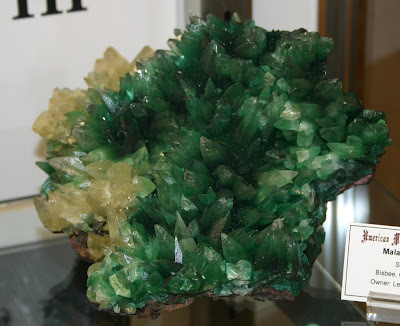 The Mineralogy Database (mindat.com) continues to post new photos and videos of special exhibits at the most recent Tucson Gem and Mineral Show. The 11th photo collection went up yesterday, covering Arkansas diamonds. Bisbee minerals were highlighted on March 2. 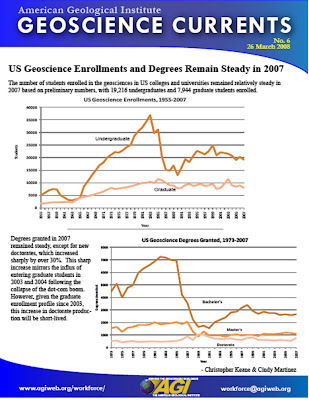 Despite reports of record salaries offered for geologists, the number of students enrolled in U.S. colleges stayed about even with numbers of the past few years, at 19,216 undergrads and 7,944 grad students, according to the latest Geoscience Currents from AGI. GeoDaze starts this Thursday with 60 talks and posters. The abstracts and field trip guide are now posted online. 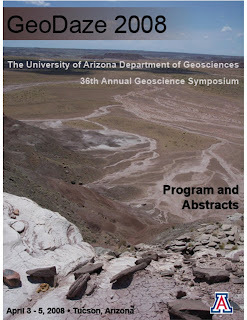 GeoDaze is a student-run symposium organized by the Department of Geosciences at the University of Arizona. Presentations are all day Thursday and Friday, with a field trip Saturday. 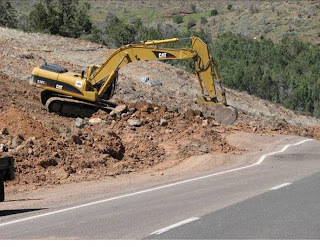 Rosie Romero, host of the popular "Rosie on the House" radio show and newspaper column, spotted the early stages of the Beeline Hwy landslide two days before it closed that road on Friday, March 21. Rosie was returning to Phoenix along State Route 87 with his family on Wednesday, when he excitedly pointed out rifts and scarps in the hill above the road to them. 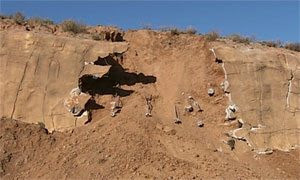 Rosie had me on his weekly show Saturday morning (KTAR 92.3 in Phoenix; KNST 790 in Tucson) to talk about the landslide. He described how striking the features were that later developed into the slide that closed the highway for 6 days. ADOT is instrumenting the slide to monitor for any further movement. We had friends (a grad school buddy and his family) visiting over the weekend and went to Tombstone on Saturday, not realizing it was Miner's Days in town. Lots of activities and lots of people. The group of us took the tour of the Good Enough Mine, a major silver mine, re-opened just about a year ago for tours. 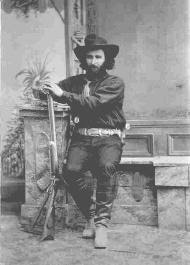 The ore body was discovered by Ed Schieffelin, the founder of Tombstone. Even the non-geologists in the group agreed it was one of the more interesting and entertaining tours we've dragged them along on. Remnants of the silver veins are clearly exposed in the mine roof and walls. The spot-lighting and new light vents, offered good views of the original mine workings and mineral exposures. Our guide, Cary, clearly enjoyed what he was doing and made sure the shorter kids got good views at the various stops underground. The mine owners, Tombstone Consolidated Mining, are working on a major expansion with a half-mile-long underground path that sounds like it will be challenging and exciting. The U.S. News & World Report rankings of graduate programs puts UA geology at 7th in the nation (8th in Earth sciences) and ASU Earth science at 31st. 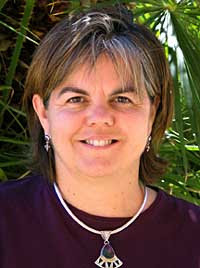 UA geosciences professor Susan Beck has been named the chair of the board of directors of the Incorporated Research Institutions for Seismology (IRIS). 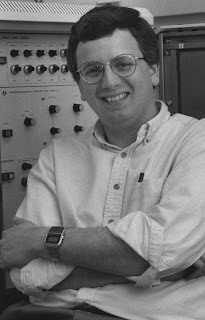 IRIS is a unversity consortium for seismologic exploration of the Earth's interior and runs the Global Seismic Network as one of its core programs. Based at Stanford University's Woods Institute for the Environment, the Leopold Leadership Program was founded in 1998 and is funded by the David and Lucile Packard Foundation. Each year the program selects u p to 20 mid-career academic environmental scientists as fellows, who receive intensive communication and leadership training to help them deliver scientific information more effectively to journalists, policymakers, business leaders and the public. "The Leopold Leadership Program recognizes rising stars in environmental science who are taking on leadership positions in their fields and within their universities," said Pam Sturner, managing director of the program. "Our program provides them with the skills and connections to make sure their research is heard and has an impact in the public arena." A new study published in Nature yesterday, by a team including Ariel Anbar at ASU's School of Earth and Space Sciences, is getting lots of international news media attention. They concluded that a deficiency of oxygen and the heavy metal molybdenum in the ancient deep ocean may have delayed the evolution of animal life on Earth for nearly 2 billion years. The Environmental Protection Agency has approved the use of copper and alloys for killing bacteria, including the antibiotic-resistance germs that are such a serious problem in hospitals. A CDA official said the copper-based products had a 99.9% kill rate within two hours against the bacteria. This could open up a whole new market for copper. Arizona supplies 60% of the U.S. demand for copper. 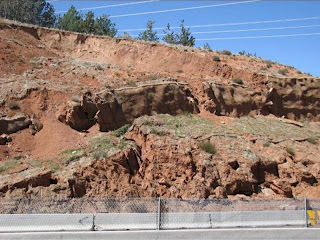 AZGS geologist Brian Gootee has posted a few dozen of his photos, without annotation, of the Beeline Hwy-SR87 landslide. He and AZGS Phoenix Branch Chief Mimi Diaz, have been carrying out reconnaissance investigations at the slide for the past few days. 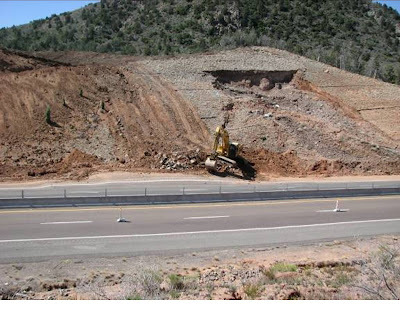 The landslide on State Route 87 was mapped by Clay Conway of the USGS in 1995 in a geologic map and report (Geology of the Kitty Joe Canyon Area, Mazatzal Mountains, Arizona) to ADOT prior to the rerouting of the highway then. He described landslide deposits (Ql) in the region being up to 120 feet thick. Ann Youberg here at AZGS superimposed the new highway route onto an airphoto with the Quaternary landslide and talus/colluvium (Qto - "mass wasting") units from Conway's map. The active area affecting the highway appears to be in the talus/colluvium unit. 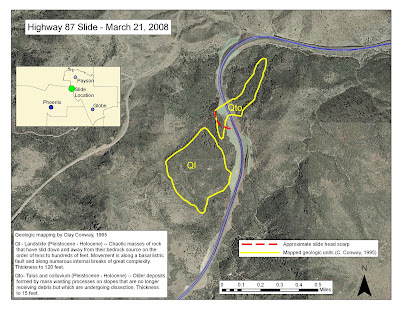 A larger version of this map and the Conway report will be posted to the AZGS website. ADOT has shared their photos taken from a helicopter, of the landslide on State Hwy 87 between Payson and Phoenix. AZGS geologists Mimi Diaz and Brian Gootee from our Phoenix branch office are investigating the landslide that closed Arizona state highway 87 (the Beeline Hwy) last Friday night. They are preparing a short preliminary report that will be posted on the AZGS website (azgs.az.gov) shortly. Here are a few photos and descriptions of the situation. Photo 1 [right]: One of several landslides on the west side of the road. Note the broken shotcrete and straw wattles. Photo 2 [right]: The shovel bucket is sit ting on top of the buckled area. Headscarps of landslides are visible on either side of the one that buckled the road. Bulldozers have already obliterated the scarps and fissures at the head of the slides on the left. Photo 3 [left]: The slide included a section of road as shown by the buckling of the asphalt. Photo 4: The landslide has buckled the highway and appears to have continually creeped over the weekend, pushing the highway up over one meter high and shifting the highway horizontally several tens of centimeters. 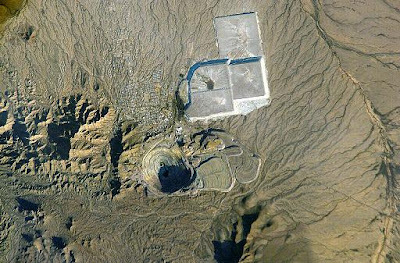 A representative from Freeport McMoRan told a community meeting in Ajo last week that the company is reassessing the New Cornelia copper mine to determine if it would be economic to re-open it. Last year news reports described Freeport as reassessing numerous inactive copper mines around the state, but Ajo was not in the list at that time. 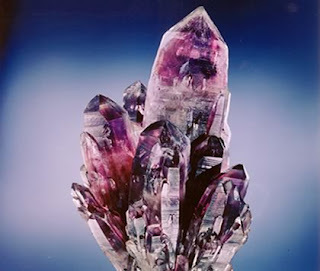 The mine and surrounding area is the only known source of the mineral papagoite. 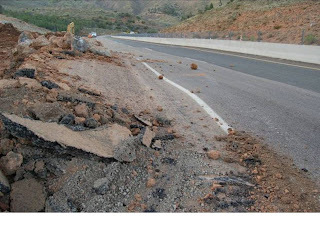 The East Valley Tribune has posted 2 minutes of excellent video of the landslide on Hwy 87 between Phoenix and Payson. 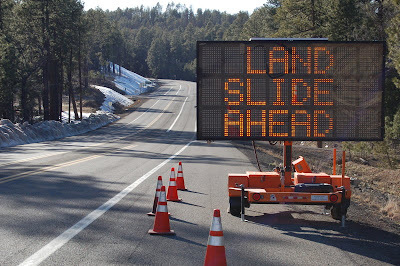 The head scarp is clear, as are amazing buckles in the road that look like the toe of the slide either plowed the asphalt ahead of it, or may incorporate at least part of the roadway in the slide. 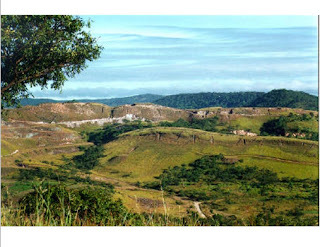 The Democratic Republic of Congo's mines contract review commission yesterday recommended renegotiating the partnership agreement with Phoenix-based Freeport-McMoRan Copper & Gold Inc. for the Tenke Fungurume copper/cobalt project. The Congo review said, "The commission believes there is justification for renegotiating this partnership." There's no question that last week's man-made flood in the Grand Canyon created extensive new sand beaches and was good for the health of the ecosystem, but critics in a story in the Salt Lake Tribune are noting that the associated loss of hydro-generated electricity will be made up by coal-fired electricity at an additional cost of $4 million. There were also questions about diverting water away from the obligation of using it to pay off the cost of building and maintaining the Glen Canyon dam. The additional cost was said to be $10 per home served by Colorado River hydroelectricity. While the story didn't say so specifically, the reference to more coal generated electricity certainly raised the irony of more CO2 being produced as a result. A UA hydrology professor says we can use lightning, earthquakes, storm events, barometric variations, river-stage variations, and other natural phenomena, as power sources to carry out CAT-scans of groundwater basins. 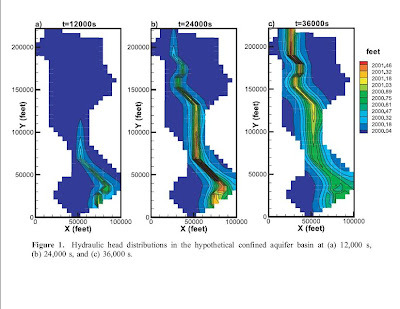 The goal is "high-resolution characterization, monitoring, and prediction" towards understanding and prediction of subsurface processes at basin scales. With the steady increase in copper's value, the incentives to open new mines, increase production, and inject renewed sources of stable revenue into the state's economy are evident. 12 active copper mines in Arizona directly employ nearly 10,000 workers (not including contactors and sub-contractors). Half of Arizona's copper is mined in Morenci. An additional 9 copper mines are expected to begin production in the coming years. The Resolution Copper Project, near Superior, is expected to provide 25% of the U.S. demand for copper after it begins production. The effects of economic growth driven by the mining industry can be seen statewide. In 2006, copper mining produced $1.4 billion in personal income; $3 billion in business income; and $325 million in state and local government revenue. Money generated from Arizona's mining industry is spent in tourism, commerce and business transactions in communities throughout the entire state. As the aggregate economy slows, the dollar drops, stocks taper and fuel rises, the increased demand for copper spurs an increased value of the metal – a welcome indicator of economic optimism and confidence for Arizona. 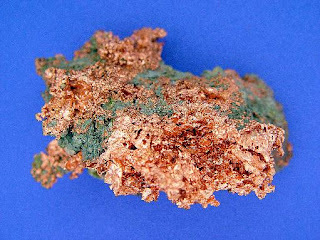 · An average single-family home contains 440 pounds of copper. An average multi-family home contains 280 pounds of copper. Over 50 pounds of copper is in the average US-built automobile. Today's luxury vehicles have about 1500 copper wires, totaling over 1 mile in length. An average motorized farm vehicle contains 63 pounds of copper, while an average construction vehicle contains 66 pounds of copper. A typical diesel-electric railroad locomotive contains about 12,000 pounds of copper. 9000 pounds of copper is found in a Boeing 747-200, including 632,000 feet of copper wire. High-speed digital telecommunication cable is made of copper. Category 5 lines can accommodate bandwidths of 100 megahertz, while newer Category 6 lines can deliver 250 megahertz and carry data streams of up to 1 gigabit per second. Will Wilkinson was voted in as President-elect of the 11,500 member Society for Mining, Metallurgy, and Exploration at SME's annual meeting last month. He will become President in 2009. Will is Vice President, Africa for Phelps Dodge Exploration, a wholly owned subsidiary of Freeport- McMoRan Copper and Gold Inc. in Phoenix, AZ. According to his bio on the SME website, He is responsible for project direction, reconnaissance and acquisitions on the African continent. He has worked in base and precious-metal exploration worldwide for Duval and Westmont Mining before joining Phelps Dodge in 1991. Will received his B.S. and M.S. degrees in geology from the New Mexico Institute of Mining and Technology and his Ph.D. in geosciences from the University of Arizona. Will also serves on the AZGS State Mapping Advisory Committee that determines where we carry out geologic mapping in Arizona each year. Will is the husband of Pam Wilkinson, a geologist with AZGS in our Phoenix branch. House Bill 2713 in the Arizona Legislature will require public schools to accept students' personal religious viewpoints as answers to tests or assignments. The bill sponsor, Rep. Doug Clark of Anthem, uses the teaching of evolution as the example where students might challenge what is taught by the schools and offer their beliefs as answers. This strikes me as similar to the situation in Kansas in 1999, which drew national and international criticism of Kansas as an intellectual backwater. There, the State Board of Education downplayed teaching evolution in part by allowing any other concept to be brought into the classroom if the teacher allowed evolution to be presented. The net effect was to intimidate teachers from bringing up the subject or risk turning over their classrooms to every body who wanted a pulpit for their views. What will this do for Arizona students applying to college? 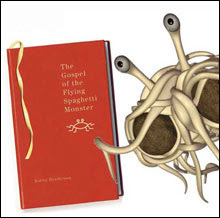 Is that "A" in physics because they really understood quantum theory, or because they gave a cogent explanation of how the Flying Spaghetti Monster works? Legislation was introduced in the U.S. House yesterday to ban uranium mining on 1 million acres of federal lands in watersheds surrounding Grand Canyon National Park. This comes a week after a coalition of environmental groups filed suit against the U.S. Forest Service for permitting uranium exploration drilling to go forward in the Kaibab National Forest. 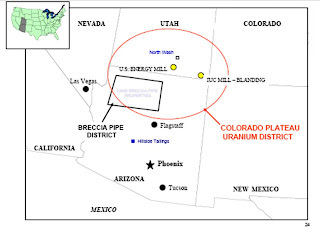 Rep. Raul Grijalva scheduled a House hearing in Flagstaff on March 28 to examine the impacts of uranium mining near Grand Canyon. 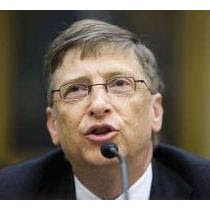 Microsoft chairman Bill Gates [right: Reuters] testified in front of the U.S. House of Representatives Committee on Science and Technology last week with a blunt message: "...the evidence is mounting that we are failing to make the investments in our young people, our workers, our scientific research infrastructure, and our economy that will enable us to retain our global innovation leadership." This is a message that has been repeated by business, scientists, governors (especially by my boss, Janet Napolitano), and key congressional leaders, but it doesn't seem to be getting across to the American public in a meaningful way. Gates declared that we "face a critical shortfall of skilled scientists and engineers who can develop new breakthrough technologies." His second point is that "the public and private sectors are no longer investing in basic research and development (R&D) at the levels needed to drive long-term innovation." 4. Providing incentives for private-sector R&D, so that American businesses remain at the forefront in developing new technologies and turning them into new products and services. What happened during earth's "dark age" (the first 500 million years)? How does earth's interior work, and how does it affect the surface? 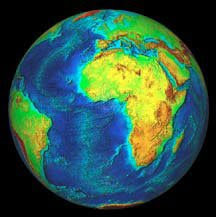 Why does earth have plate tectonics and continents? How has life shaped earth -- and how has earth shaped life? Can earthquakes, volcanic eruptions, and their consequences be predicted? 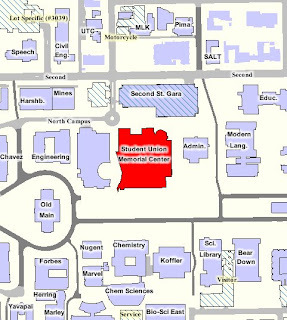 Last August, the Arizona Board of Regents also formally approved an agreement between the City of Tucson and the UA for a $130 million science center and state museum complex to be built as part of the Rio Nuevo downtown development project. The Mineral Museum will be part of the new science center. The Freeport donation comes on the heels of the UA Mineral Museum receiving the $7+ million Herbert du Monmonier mineral collection. In comparison, the Friends of the Arizona Mining and Mineral Museum in Phoenix reports receiving $7,857 for all of last year, and donated $500 of that to ADMMR, which runs the Phoenix museum. ADMMR reports donations of $5725 (including the $500 from FAMM), but did not report how much of that amount went to the museum. 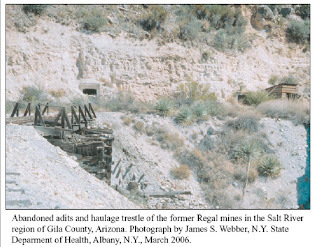 A reported 75,000 tons of asbestos minerals were mined in the Salt River region of Gila County. 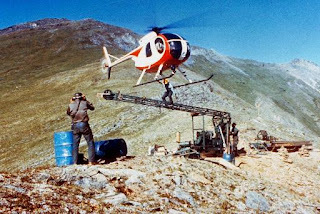 Mining ende d in 1982. Van Gosen writes that asbestos was discovered in 1872 at the town of Chrysotile. 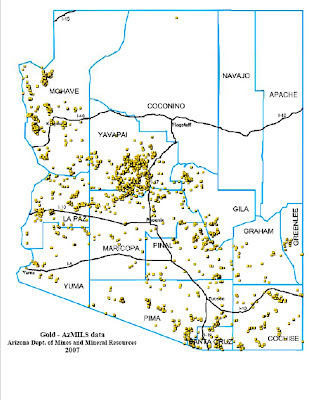 Of the 46 a sbestos mines in Arizona, 44 were in Gila Co. The other two were small producers in the early 1900s in what is now the Grand Canyon. Prescott's new geology club met for the first time last night in the Prescott Library and heard Ed Wolfe talk on "The Current Eruption of Mount St. Helens," showing what has happened on the mountain since the eruption in 1980. The next meeting will be at the Prescott Library, 6:30-8:30, on Wednesday April 9. The speaker will be Terry Steinborn talking on "The Yucca Mountain Nuclear Waste Disposal Site." 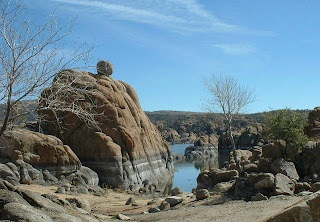 Anyone who wants to be on the Prescott geology club email list, contact Debbie Allen at debbieallen@cableone.net. Is it time to buy a gold mine in Arizona? The price of gold passed $1,000 an ounce this morning which no doubt will be a major news story throughout the day. Ambassador: Precambrian gold and silver deposit with underground and possible open pit. Bonanza: Detachment fault gold / silver deposit. Former Phelps Dodge project. 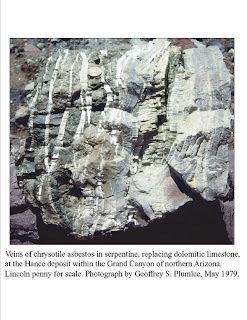 Bouse: Gold and silver detachment fault deposit in La Paz County, Arizona. Former Homestake Gold project. Clara Moro, Silverfield Gold: Gold deposit in detachment fault environment. The Clara property has encouraging results from a drill campaign by Nevada Pacific. The Silverfield may be a hot springs high grade gold / silver deposit in detachment fault environment. Its close to Clara Moro and could be jointly explored. Ester Basin: Gold, silver and copper deposit spatially associated with diatreme in detachment fault environment. Former Phelps Dodge project. 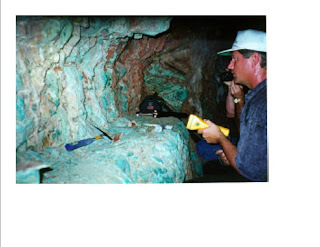 McCracken Gold: Gold with silver and copper in breccia zone adjacent to one of Arizona’s historic silver producers. Mockingbird: Gold and silver deposit related to detachment fault. Anaconda / Chevron work indicated potential. North Rawhide: Upper plate gold, silver and copper deposit. Former Phelps Dodge project. Oatman: A dozen mines in Arizona’s largest primary gold district. Includes patented Lexington gold mine. High-grade Tertiary vein deposit in volcanics with potential for low-grade open pit resource. 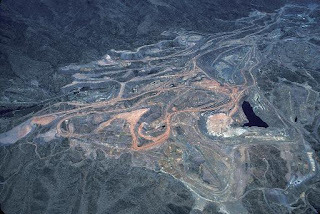 South Copperstone: Large contiguous claim block adjacent to the Copperstone Mine, Arizona’s largest recent open pit gold producer. 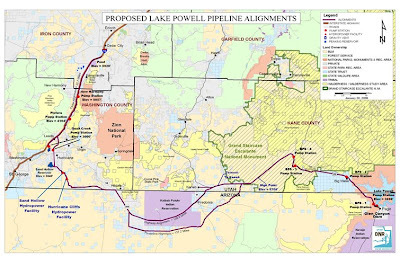 A project to deliver 100,000 acre-feet of water annually from Lake Powell to three water districts in southwestern Utah will construct a 69-inch diameter pipeline across extensive areas of northern Arizona. The State of Utah Board of Water Resources intends to submit applications to the Federal Energy Regulatory Commission this month. The project includes pipelines, power transmission facilities, penstocks, storage facilities, and booster pump stations. Early cost estimates were around $500 million but figures of $1-2 billion are being tossed around by critics. It's expected to take 10 years to build.